Tomato crises on the rise? Seems that way for me at least... hardly a day goes by that I'm not getting an email, phone call, or facebook message about tomatoes. They're not ripening, the blooms are fading, my leaves have spots, etc. No, I do not have any ripe tomatoes yet, but that's here in zone 6a Connecticut. On average here in the northeast things are running behind by a couple of weeks. So while I've got lots of green fruit, nothing is looking even close to ripe. The flowers look like they're dying? Well, to some extent they are, the blooms need to fade in order to set fruit, but not every single bloom will actually form in to a tomato. The trifecta of good weather/timing, good pollinators, and available nutrients all need to be in place. There is a case to be made for removing some of the flowers, particularly ones that are close together to create a situation where there is stronger fruit set. I rarely do it, even though it makes good scientific sense. In the picture above, there is a faded blossom between the already too close fruits, could a third tomato survive here, probably not. I might get around to removing this blossom, but it's about #367 on the list of gardening chores I need to get done right now. My leaves have spots do I have late blight? Is probably the most common question this year. 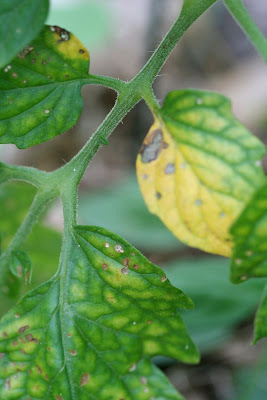 Since the awful spread of Phytopthora infestans (more commonly known as late blight) two summers ago wiping out almost every tomato in sight, everyone is on high alert for this pathogen. Here's the good news, phytopthora cannot survive under extreme weather conditions. While it likes the cool rainy spring that we had, the 90+ degree days in early June probably knocked it down. And if for some reason it didn't the 102 degrees that we hit this past Friday definitely did. Lucky for you, late blight is pretty easy to identify, and it does not look like most other fungal pathogens. Here's the best way to prevent these problems; One - water in the morning, and water the ground around the plants, not the leaves. Soaker hoses are ideal for this. Two- don't plant too close together, air circulation is crucial (I'm not to embarrassed to admit I failed this year, I want lots of tomatoes!) Three - practice at least a 3 year crop rotation, even if you've got a small garden, this is a must. This is less necessary if you grow your tomato plants in pots. The good news is even with one of these pathogens, there is a good chance it won't interrupt your fruit set. So don't go running to home depot to buy fungicides....you don't want to eat that crap! If the leaves really bother you, as then just pick them off and dispose of them in the garbage - not your compost bin. I've got bloom death in Huntington Beach! My roma has three fruits now but they are not ripening and the plant has stopped growing. Our Krim tomato blooms are dying as well but this plant is growing. We do not have browning leaves, or mildew. Any ideas would be appreciated!